Mason bees are native throughout most of the U.S. They are a smaller than a honey bee and metallic blue or blue-black in color and sometimes mistaken for house flies. They get their name from their habit of using mud to cap off cells between eggs. They are non-damaging and use existing spaces, hollow stems, and insect holes found in trees or wood. Male mason bees emerge in early spring and immediately begin to forage for pollen and nectar. Soon after the males emerge, the females will follow. The females collect from fruit trees, berries, flowers, and vegetables and pack this food into the far end of their nesting hole. Then the female backs in, lays an egg and plugs up the cell with mud. This process continues until she has filled the entire tube/reed with a series of pollen/nectar/egg cells. The eggs that are destined to be female are always laid at the back of the nesting tube, leaving the male bees to emerge first in spring. Once the mason bee has completely filled one tube, she will begin filling another one. The pollen-collecting and egg-laying will continue for four to six weeks, and then the bee will die. The mason bee larvae will hatch a few days after the eggs are laid. They spend the summer developing into new bees and by fall they are fully mature bees in newly spun cocoons still in the same nesting tubes. They hibernate all winter and wait for the signs of spring to emerge (55 to 60-degree days). The colony should continue to grow every year as long as you provide clean nesting material so they can lay their eggs and the cycle can continue. CAN I RAISE MASON BEES? Besides the minimal upkeep, mason bees are the super pollinators! Do you have a small backyard garden or orchard? 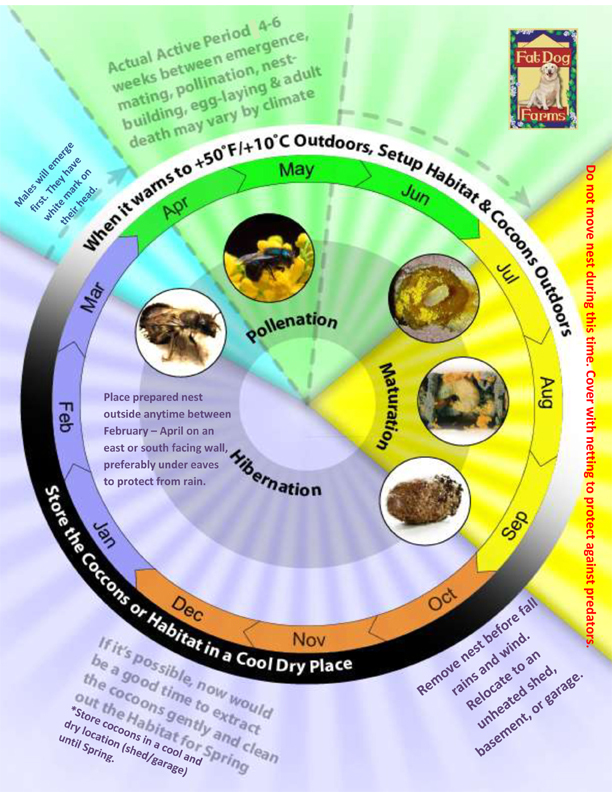 Studies have shown that mason bees pollinate several times more than honey bees. They have a lot more time on their wings since they do not have a hive to defend, nor a queen to protect. Mason bees will rarely wander very far from their home. They travel only 50-100 yards, making them your own personal pollinators for your backyard. Although they don't make honey, the reward of plentiful crops of fruit, berries, and vegetables is satisfying. Another benefit of housing mason bees is that they also pollinate on cool rainy days when other bees are more likely to take the day off. These non-aggressive bees are also less likely to sting you which makes them great around children. The males do not have a stinger, and the females will only sting if trapped or squeezed. Owning and raising your own mason bees will add beauty, activity, and pollination to your yard and garden. We have raised mason bees for 15 years and our crops have tripled in size due to the massive amount of pollination that is taking place at Fat Dog Farms. Typically, you will need about 800 – 1,000 bee cocoons per acre. Most home gardeners start by purchasing 3-5 tubes of bees. Each year, your colony should increase in population by five times! First, you will need a mason bee house. We highly recommend that you DO NOT drill holes into a block of wood unless you intend to use a paper liner or tube inserted into each hole. Drilling holes without tube liners can cause the bees to become trapped from debris and they may die. 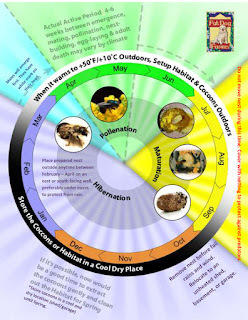 You need to be able to remove the cocoons in the fall to maintain a large happy colony. There are several companies that sell housing units and tubes or you can choose to make them yourself. Second, you need a location for your colony. A sheltered location on the outside of your house, barn, shed, or garage that faces south or east is best. Third, you will need bees! It is recommended to purchase 3-5 tubes of bees depending on the size of your yard and garden. Eventually, you could have approximately 800-1,000 bees per acre, depending on how well you maintain your house(s). To find out where you can buy our blue orchard mason bees and supplies, go to our page WHERE TO BUY OUR BEES and SUPPLIES.